In a bowl or pint-sized mason jar with lid, add 1/2 cup of the coconut milk, cinnamon, nutmeg, ginger, vanilla, and cornstarch. Whisk thoroughly, or shake if using a jar, until the mixture is fully incorporated and smooth. Pour the remainder of the coconut milk into a small saucepan. Add the pumpkin puree, sugar, and salt to the saucepan and whisk to until smooth. Stir over medium heat, until mixture begins to bubble. Reduce heat to low. Add the coconut milk and spice mixture. Whisk constantly until the mixture thickens. Spoon into a serving bowl or individual dishes. Cover with plastic wrap and chill. Top pudding with whipped cream, crystallized ginger, and gingersnap crumbs. Serve. I would have loved to see a bigger image! Looks lovely. When you have the time, do drop by my new post. I’d love to hear from you. Thank you! Your site looks lovely as well. This looks so good! I’ve seen pumpkin mixed with coconut a few times around the inter webs, and each time it looks better and better! Thanks Liz, I was surprised that there were not more examples of these two ingredients working together in a dessert. Their time has come. I agree with you about a pie after all that turkey. This is a great idea. I love how you brighten the pudding with coconut. 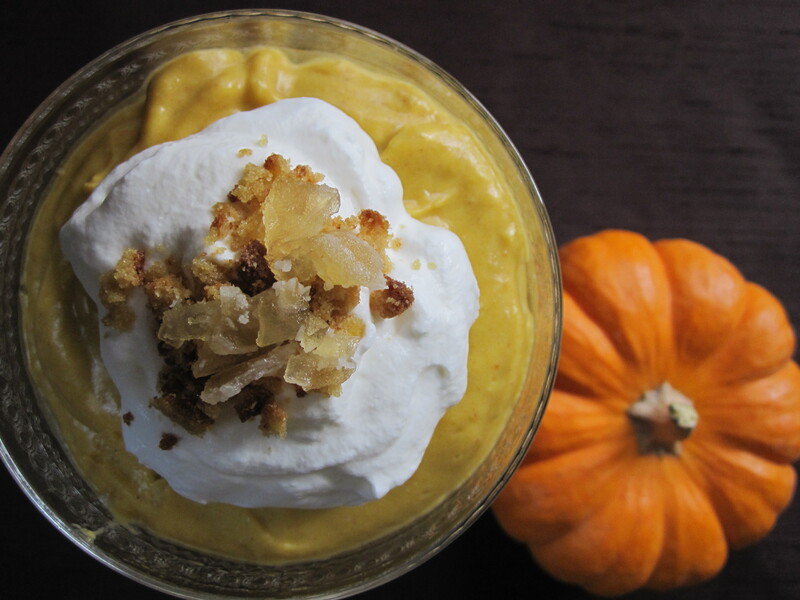 I love the combination of pumpkin and coconut! I will definitely give this a try. I know what you mean about pie following Thanksgiving dinner. My favorite time to have pumpkin pie is for breakfast the morning after Thanksgiving! Pie for breakfast, now that is a great idea!